After publishing the Robotic Process Automation What Why How All You Need to Know [Vendors/Tools/Jobs/Checklist], I received requests from some of my readers to provide a comprehensive list of Companies using Robotic Process Automation. In this post I’m going to cover a few companies using/partnered with robotic process automation vendors. As I listed in my previous post there are many RPA Vendors out there in the market so getting the complete list of companies using RPA and vendors will be a challenge, however I have compared 4 leading RPA vendors with 82 companies associated with them. 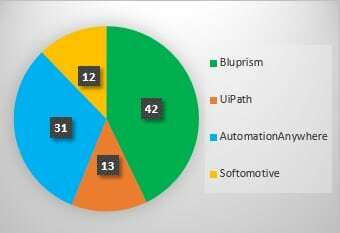 Out of 82 companies; 42 are using/partnered with Blueprism, 31 are with Automation Anywhere, 13 are with Uipath and 12 with Softomotive. Let me make it clear, the above comparison is not to conclude one RPA solution is better than the other based on the number of companies partnered with it. There are multiple factors involved in selecting Robotic Process Automation vendor by companies (Review the: Robotic Process Automation Tool selection Checklist) based on the industry they support. Infrrd AI takes out the pain of capturing data and extracting intelligence from a plethora of documents, delivering you the information you need without having to manually go over documents one by one. The software basically saves you precious time and effort and you never have to worry about accuracy as Infrrd AI uses the latest OCR technologies and their own AI algorithms to ensure the precision of every extracted data. I find this very interesting. 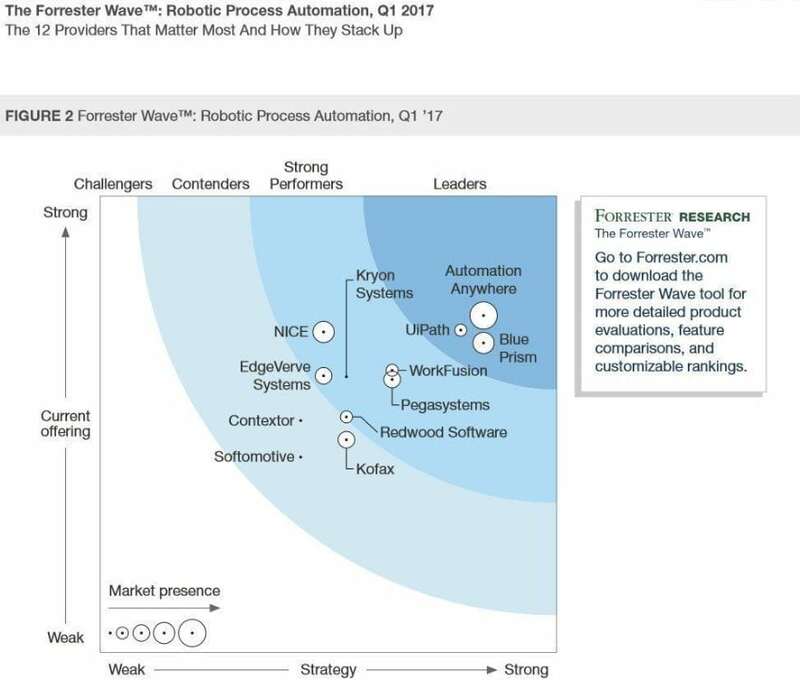 AI and Robotic Process Automation, good job with the analysis. Post is very interesting, there is a new tool called JiffyRPA, which I found very helpful. JiffyRPA helps businesses automate tasks through intelligent robots that can detect and adapt automated scenarios based on change. This allows organizations to utilize their staff more productively, without having to worry about tasks that are critical yet add no value to the system. Right from processing unstructured data that is captured in different formats, to making cognitive decisions and using NLP and ML based algorithms, JiffyRPA has helped customers achieve close to 90+% of automation. This is significant as most of the traditional RPA solutions are rule based and only achieves lower automation levels for complex processes. Dear Anson, Could you please provide a detail comparison among Blue Prism, Automation Anywhere and uIpath. I have got some basic details, however a detailed understanding will be helpful. To be specific to my question, I would like to know what would a company look for before adopting any of these three RPA vendors. Very good beginning to intermediate level. Thanks! Please send any comparisons you may have for the different tools. Appreciate your work. Hi, I m going to do a course with RPA blue prism. Is that good for future?? Is there are openings all over?? Is that sustain for atleast 5 years??? Hi, this is kiran. I want tolearn this RPA. Is there any coding required for this RPA. Beause i don’t have the technical knowledge, I came from B.Sc chemistry background. Anson, AutomateWork is another leading company. They are partners with uipath, blueprism for RPA. They are into RPA, AI and ML. Thanks for the info Sara. I’ll include it in the next update. ? This Information is apt for anyone who`d want to understand the RPA Adoption in the Industry. Currently I am doing a research on impact of automation on finance industry. So could you send me the list of all financial companies in New Zealand using RPA. It would be really helpful if you could. Thank you Ashwin. Currently I’m gathering the information I don’t have it readily available, will share it soon. please share more detail on this .. Thank you Deb 🙂 Sure will share more insights soon! @Anson are you sure that the list is of companies *using* RPA? Broadly speaking, these names are of “RPA Implementers” / “Service Providers” and not the ones who are consuming RPA for their processes/operations automation using RPA. Correct me if this is not true. Thanks. Thank you 🙂 Yes you have a point but most of these companies are both RPA consumers as well as the Implementers. So thats the reason, I have mentioned in the beginning of the article “a few companies using/partnered with robotic process automation vendors”.